These photos were taken in early-to-mid August in my Middle Tennessee garden. Hope you enjoy! Ajuga genevensis, personally I find this much more attractive than the typical A. reptans. It's also much harder to find. This is in partial shade (morning shade, afternoon sun) and you can see that it's lush, happy and healthy with very minimal supplemental water. I have a patch growing pretty well in full sun too, but I think it's happier in partial shade. Here's the one surviving Alleghany Viburnum. Not a pretty picture. What was I thinking? I know I've seen some good looking dense evergreen viburnums around town in inhospitable locations (i.e. highway offramps). Perhaps they're using a different species? Or perhaps they started with smaller plants that had an easier time adjusting to transplantation. Or perhaps they used container grown shrubs (I think these were balled and burlapped and I'm of the opinion that container grown typically works much better.) Whatever the case, I have some big regrets about using these viburnums in the landscape and plan to rip them all out this autumn and replace with something completely different. Close up on Aronia melanocarpa berries. I have two kinds of Black Aronia berries - these are larger ones and I think they're the Viking variety that was bred for commercial uses (juice production?) in Europe. I also have an Autumn Magic A. melanocarpa, which going by the name, I'd guess was selected mainly for its autumn leaf color. In some ways, these are great plants. They seem very tough through heat and drought, they don't have any problems with our winter (they're hardy to zones 3-4) and as you can see they berry profusely. You don't even have to fight the birds for the berries. So what's the problem. They're bitter. Really, really bitter / astringent. These Viking ones actually aren't so terrible compared to the smaller and far more astringent Autumn Magic variety (presuming I've got my plants ID'd properly). But "not so terrible" is not exactly a ringing endorsement. Truth be told, I wish I'd planted something else. 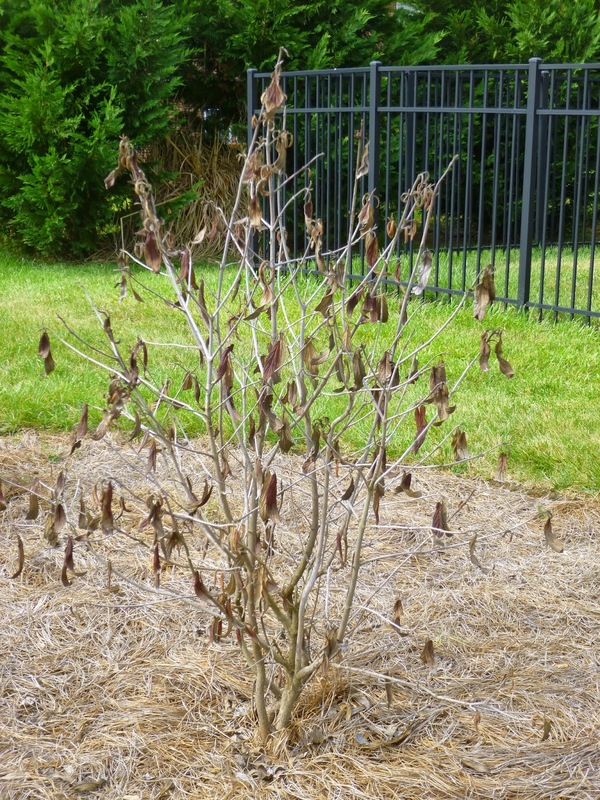 And even though they can take the heat here in Middle Tennessee, I think it stresses them out, which perhaps makes them more susceptible to the insects (I'm guessing lace bugs) that disfigure their leaves something awful and make them drop prematurely. 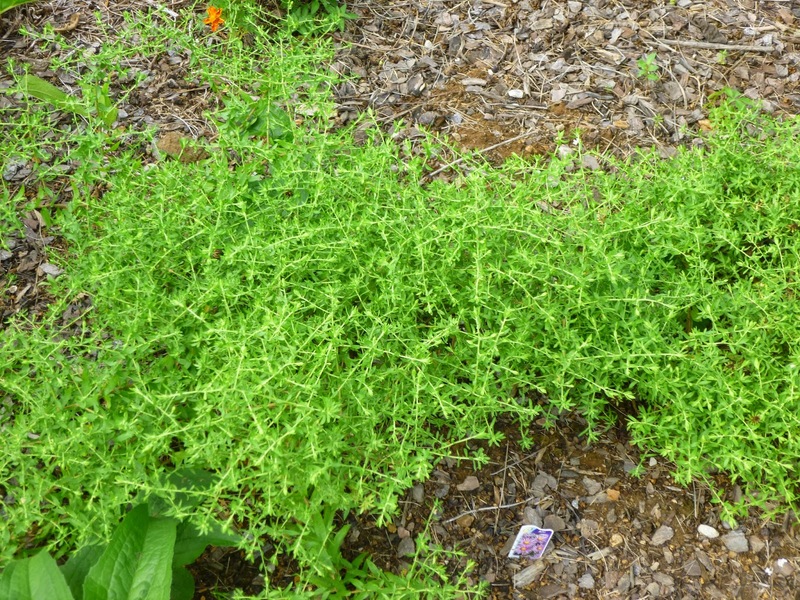 Some folks on Gardenweb seem to think that hot weather makes the berries more astringent. That seems to dovetail with my own experience, so I think folks in more northern climates (like Michigan or the Pacific Northwest) might have better luck with aronia. That said, I'm not planning to rip mine out just yet. For one thing, I have too many other more pressing landscape concerns -- like replacing those danged viburnums shown above. 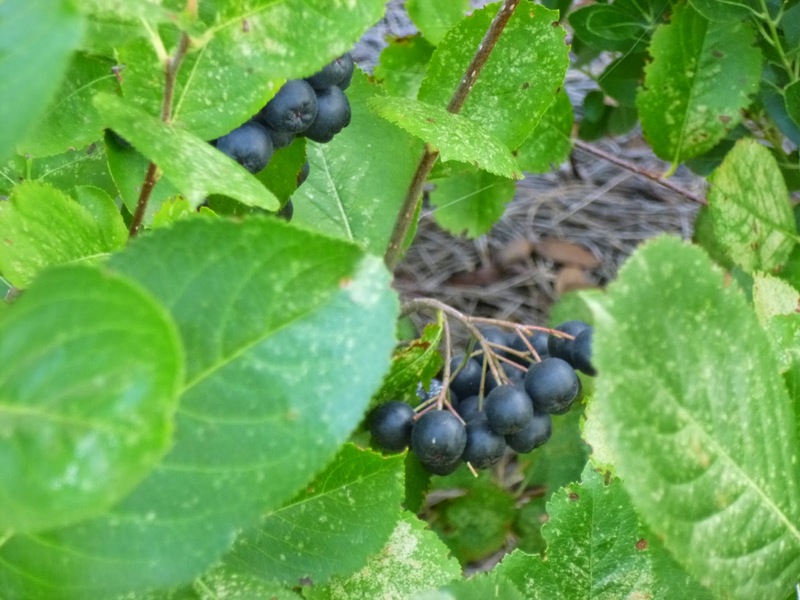 But I don't think I'd recommend Aronia for the Southeast, at least not from an edible perspective. It is true, however, that I have not yet tried adding Aronia berries to the fresh fruit smoothies I make. If I try it and it's not too awful, I may yet change my tune. "October Skies" Aster. Looking healthy and loaded with buds. 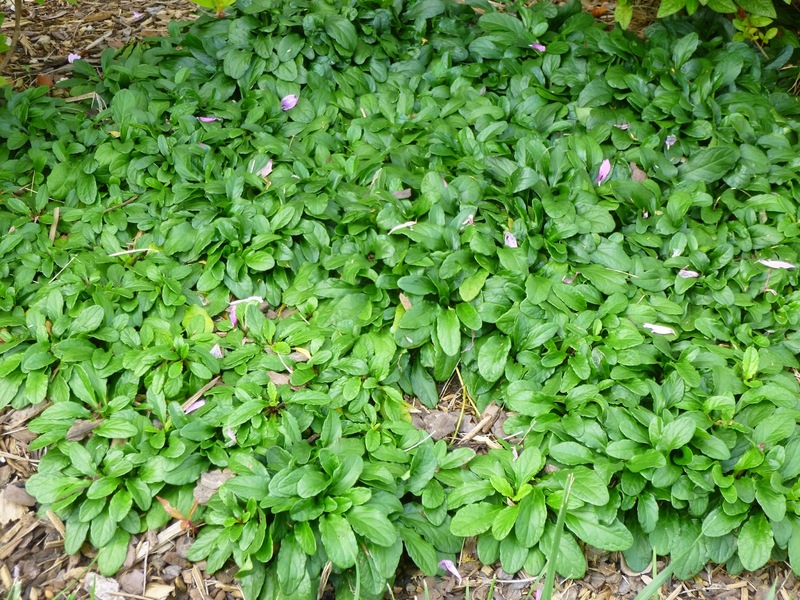 Love the way that it's spread to form a tall, beautiful weed-suppressing groundcover. Hyssop officinalis. I planted three of these earlier this year in the hopes I could trim them into a low informal hedge. That's still a work in progress, but they've grown very well in a hot full sun area next to the driveway. 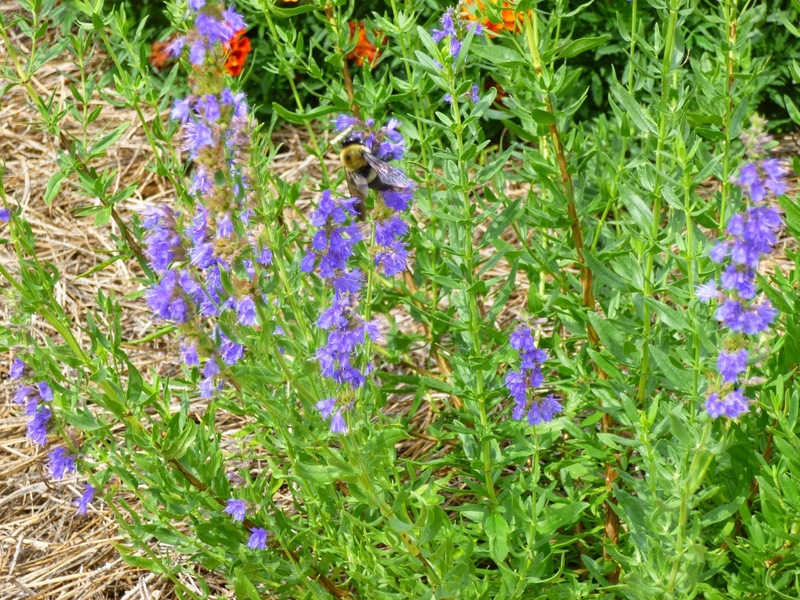 And as you can see, the bees like the blue flowers -- and so do I! 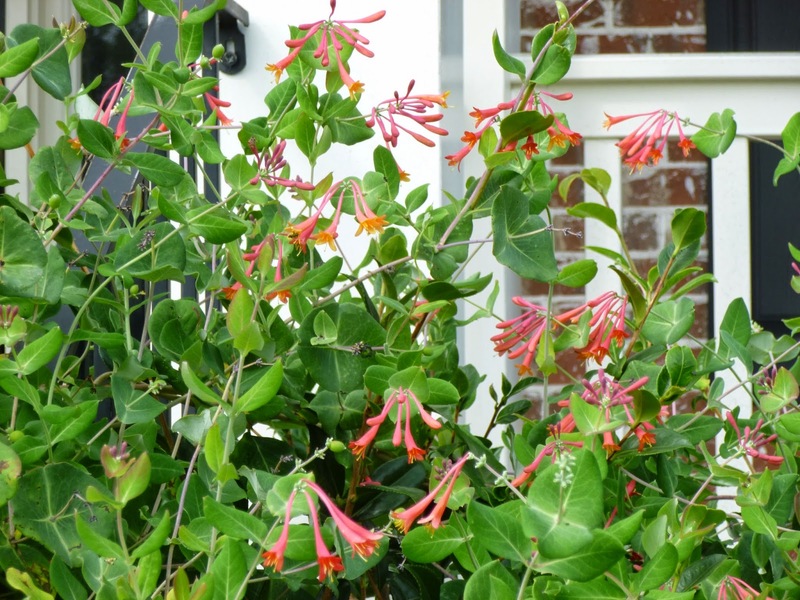 Coral Honeysuckle (native Lonicera sempervirens) still blooming strong on the front porch railing. The hummingbirds seem to love it. As you can see, they manage to fertilize the flowers, which leads to berry production, shown here as a green cluster right below the flowers . They'll ripen to red and then probably be picked off by other birds to be eaten and spread as nature intended). 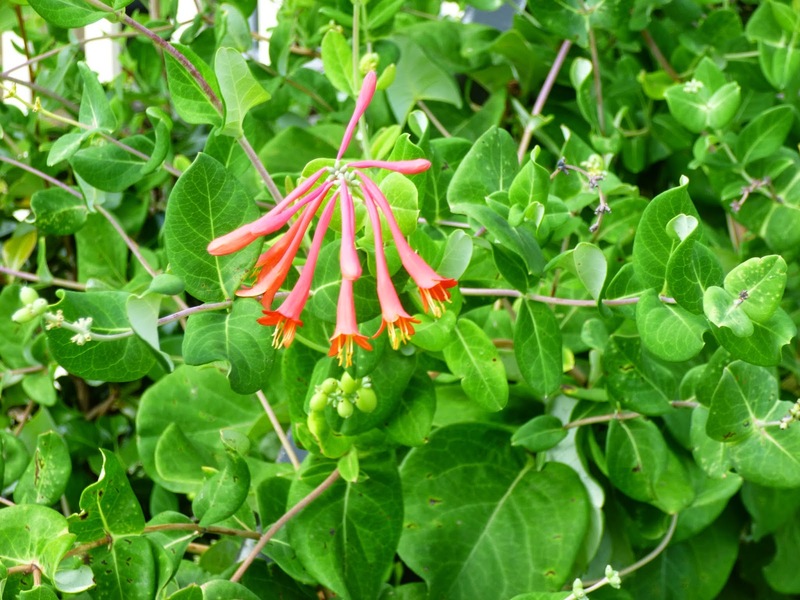 Another shot of Coral Honeysuckle. 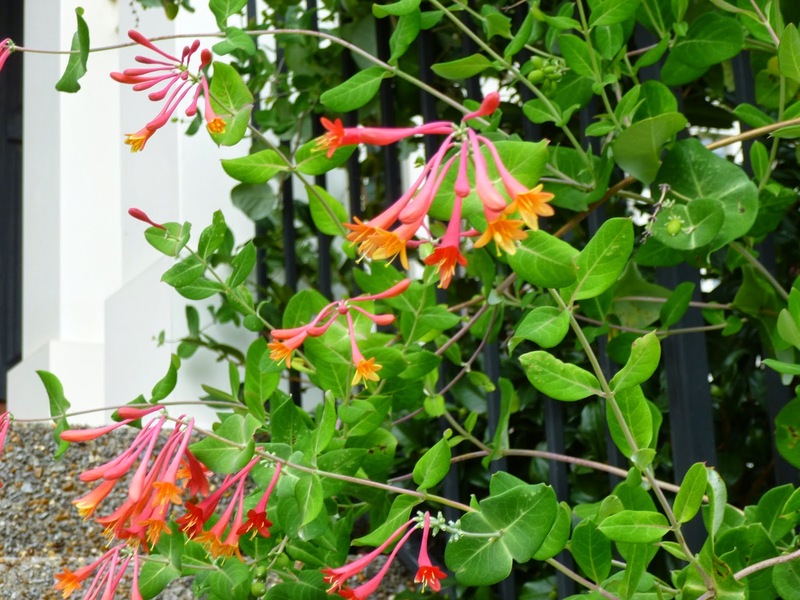 Blooms from early spring right through summer and into autumn. One of my favorite plants! Yes, it's a little rampant, but you can cut it back hard at pretty much anytime and it will bounce back. 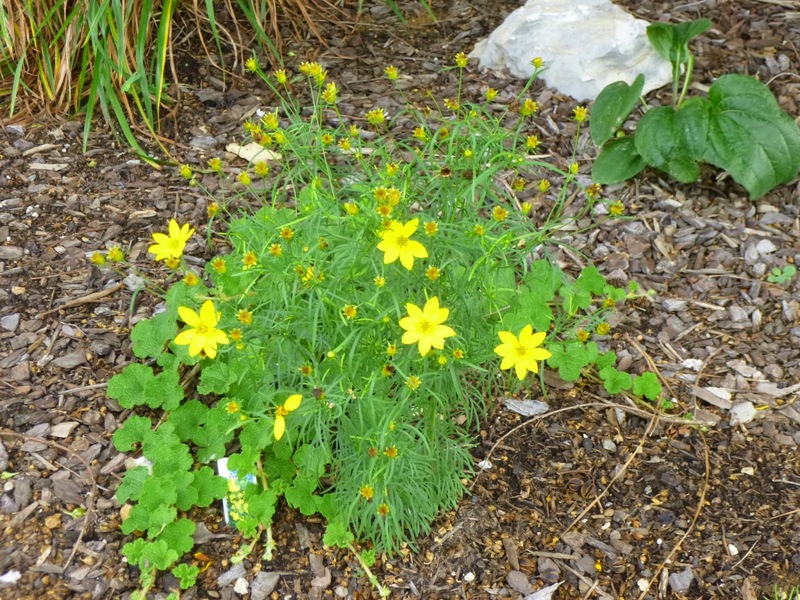 Coreopsis verticillata "Zagreb". 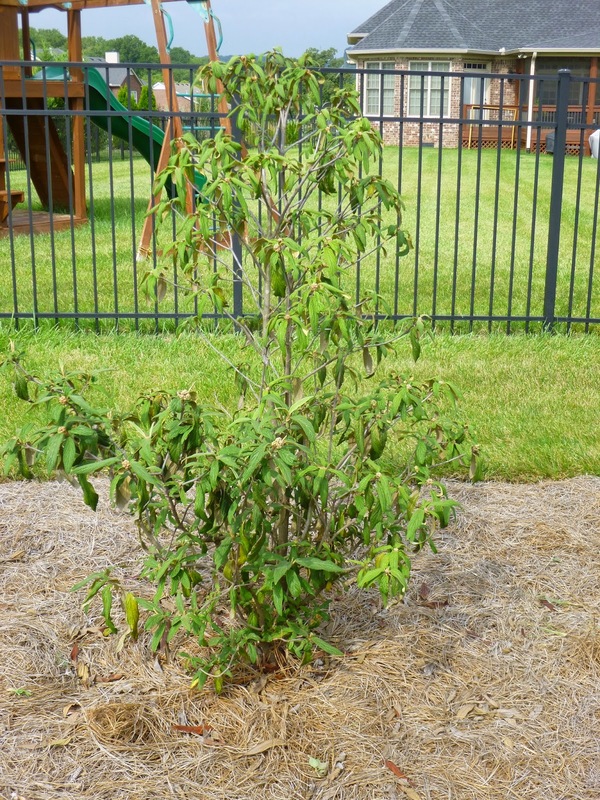 I've got two of these plants growing underneath a crape myrtle. They're probably getting a little too much shade and I might try transplanting them this autumn. That said, they're still blooming nicely and have probably increased in size by 3-4 times since I planted them early this spring. They bloom for months without deadheading and seem to attract some tiny critters (originally I just saw ants, more recently I've seen some small bees visiting the flowers too). I didn't want to overwhelm with a cavalcade of photos. So I split up the bounty into multiple posts. Stay tuned for installment #2!